Some people don’t believe me when I tell them my kids eat hummus. Just watch my video on radishes and you will see the kids happily dipping raw radishes into green hummus. Kids in our cooking camps seem to enjoy hummus for dipping raw veggies. Hummus is a Middle Eastern dip made of chickpeas, tahini (sesame seed paste), garlic, and lemon juice. This recipe was given to me by my sister, and the twist with this recipe is the addition of chopped spinach. 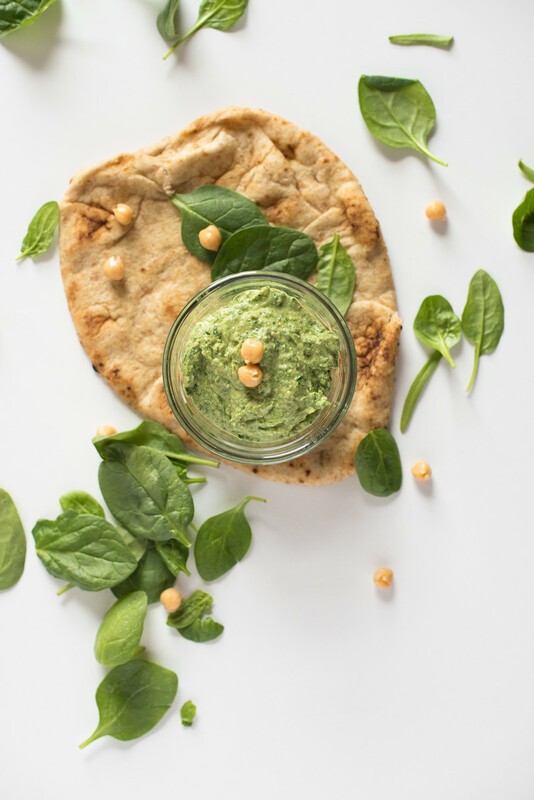 It gives the hummus a bright green color and gives it an extra nutritional punch. This is a delicious, nutritious dip for veggies, crackers, and pita bread (as it is traditionally eaten). I have written the recipe in a kid-friendly version. For me, I would add about twice to three times the garlic and a bit more crushed red pepper. This may be too “spicy” for young eaters! Our preschool students in our preschool nutrition curriculum prepare this green hummus in a lesson about peppers. 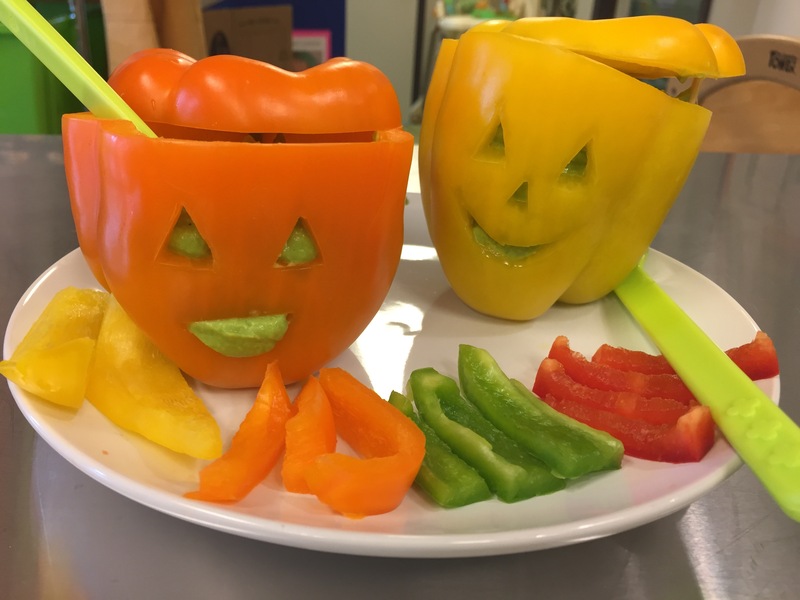 They make jack-o-lanterns bowls with peppers and place the green hummus inside. There are always squeals of delight when the hummus oozes out of the pepper's mouth! Place all ingredients in a food processor or blender and blend until smooth. Add additional chickpea liquid to achieve desired consistency. Serve with your favorite veggies, crackers or pita bread. The smooth consistence of hummus makes for a great first food for babies. This recipe also introduces some greens as well. If there is a concern about sesame allergies, you can omit the tahini. Keep the garlic light as raw garlic can taste "spicy." 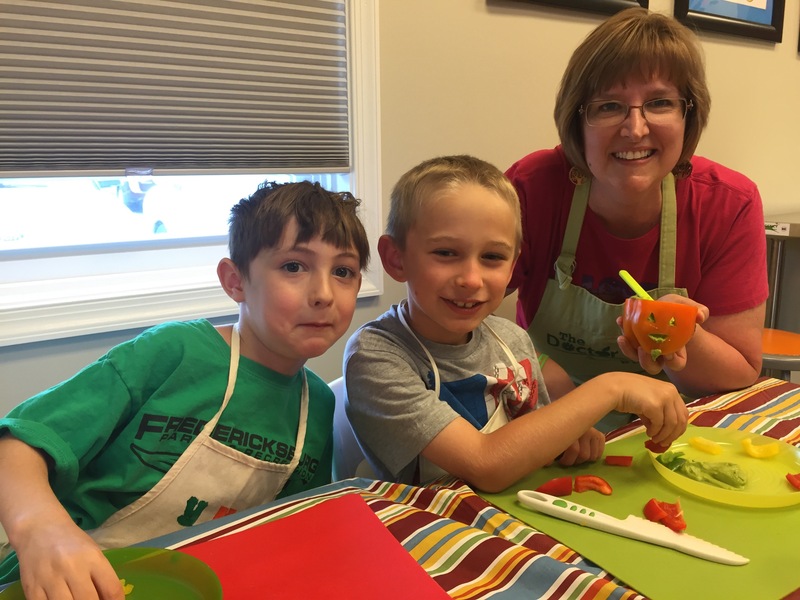 Miss Wendy enjoys green hummus with some of our summer campers!